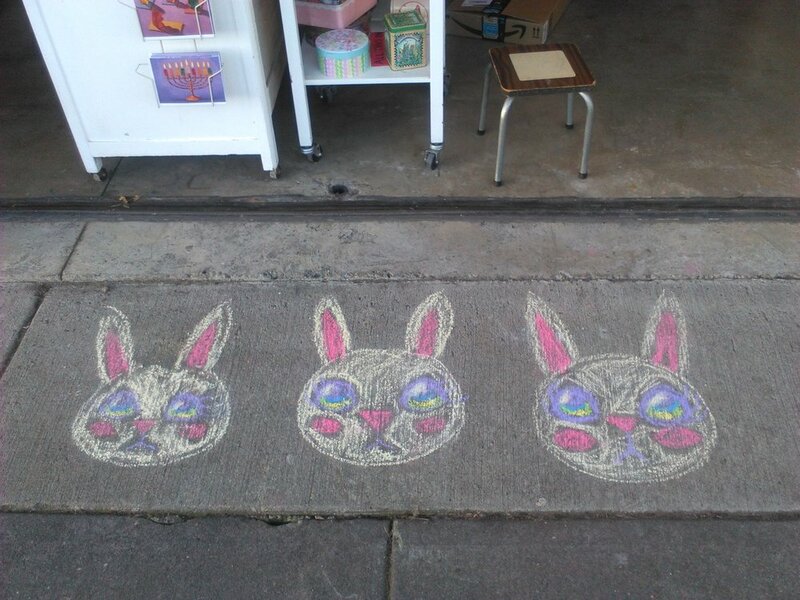 #1---BUNNY CHALK ART: What a delight to have it there to greet you and tell you to come on in. It was on the sign and on the sidewalk. #2---A HUMONGOUS CANDY BAR: Colorful candy was everywhere to make your mouth water. #3---COLORFUL CHARACTERS: Yes, even the folks there were colorful and fun, saying hello to everyone. #4---A BUNNY GIRL! Yes, a bunny girl made an appearance (she was also the owner of this candy dynasty). #5 LIVE CUDDLY BUNNIES! Yes, I couldn't believe I got to pet and cuddle some cute bunnies! You could have too. #6 BUNNY ART, OF COURSE! Last but not least, you missed the many pieces of bunny art. They were so fun. Some funny. Some fantastical. All wonderful...because they were odes to bunnies! 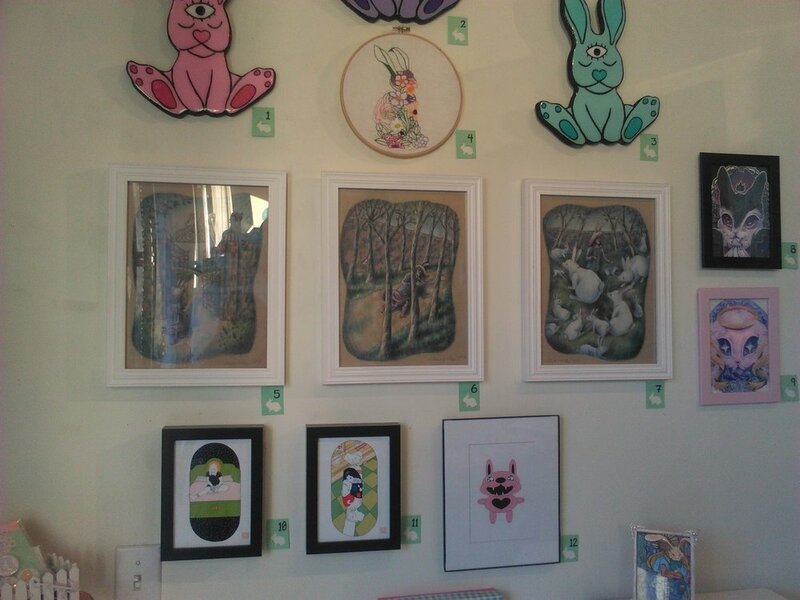 You can see my vintage bunny art in the 3 white frames. Everyone thought they must have been from an old children's book. Some people said it looked so familiar like they has seen it somewhere before. Well, that's what I was going for. I'm glad my bunny fantasy adventure hit the mark. I realize there are actually some pretty big bunnies out there in real life. But do they ever get this big? I mean do you have to fear that they may knock you down and crush you because they are so big? 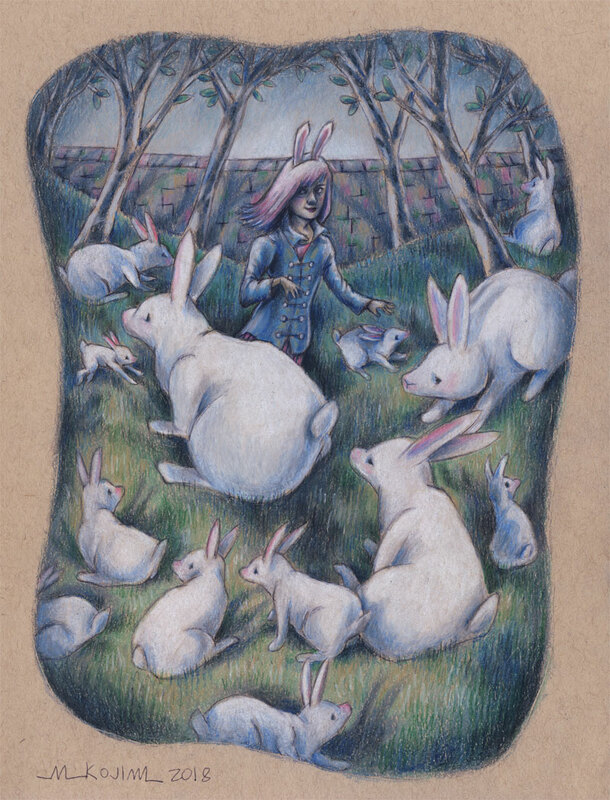 I thought it might be equally sweet and exhilarating to come across giant bunnies, so that's what I drew in my 3rd drawing for Candy Babel's bunny themed art show. I showed an artist friend this drawing and he said it made him feel like he was getting a hug. I guess he meant it was just so warm, sweet and charming. I can see that. But I can also see how you might want to tread softly in a field of giant bunnies. What do you think? How would you react in such a strange situation? 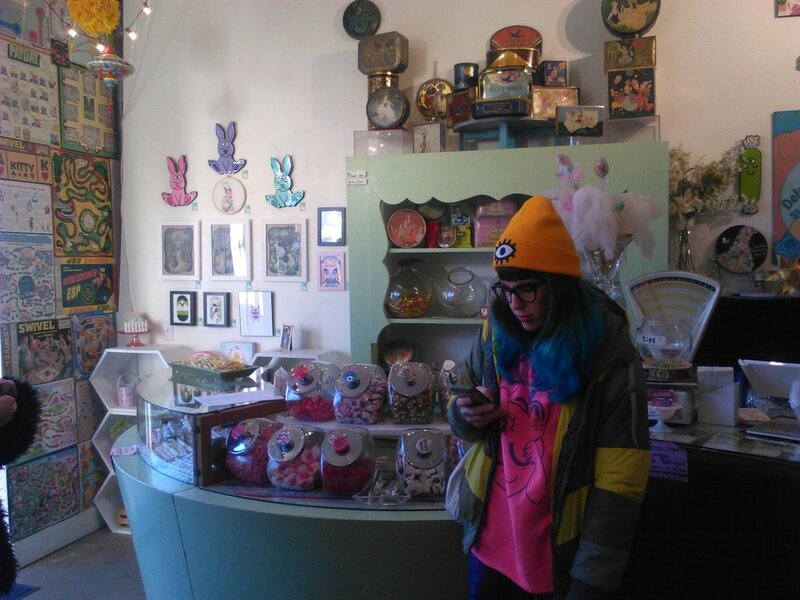 I should know soon if I got into that bunny art show. Wish me luck. I really want to get into it. I put a lot of work, imagination and love into these funny bunny drawings. Can you see that? Can you tell? Happy Valentine's Day to All the Odd Couples Out There (Like Sasquatch & Bunny Girl)! Remember valentine's day isn't just for lovers. It's for anyone....any odd or even couple out there (like a Sasquatch and a bunny girl)! I hope you have a wonderful valentine's day! Eat, drink, & be merry! I will too. 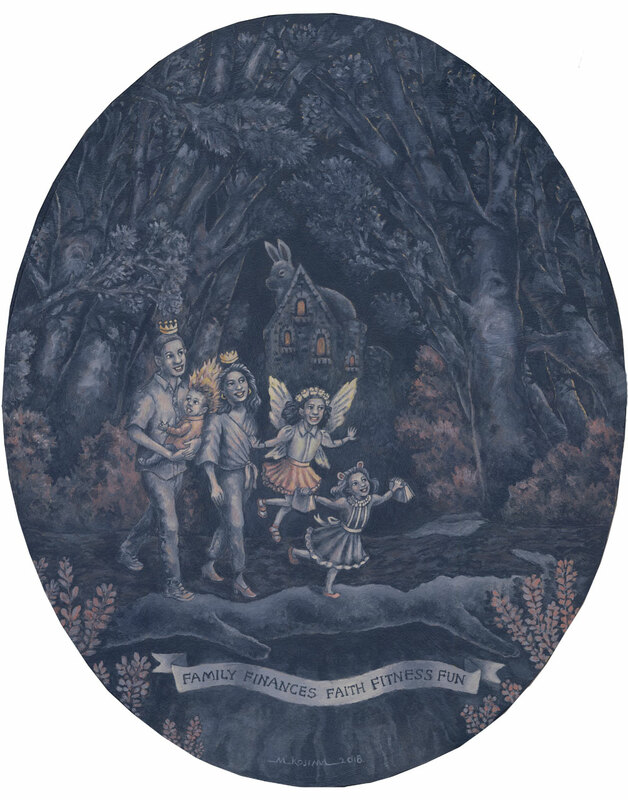 "Pacific Wonderland" painting of a very odd, yet sweet couple. 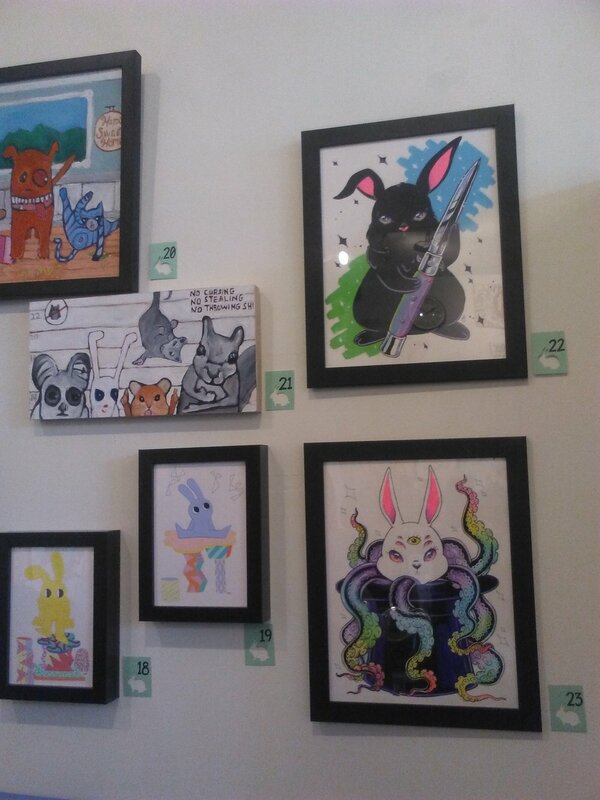 For the Bunny Art show at Candy Babel, I decided to create a bunny girl adventure in 3 drawings. It had to be mysterious, magical and sort of sweet...I mean...after all, it's for a candy shop, right? Below is the first drawing I created for the bunny themed art show. I thought I'd show a bunny girl who comes across a mysterious iron gate with bunnies on it. She has to ask herself if she should trespass or not. Work in progress of "Bunny Trespassing" drawing. Work in progress of "Bunny Trespassing" drawing, now with some color. I'm actually worried about it. I don't know if I'll get in this art show. I submitted it, but I just don't know. I haven't shown my drawings to anyone except an artist friend....ok.....and now to you too. He said he really liked it. I guess I should trust him. After all, he is a professional who sells art in several galleries. What do you think? Would you want to take home this bunny girl? Would you go on an adventure with her? Would you trespass? Final drawing fo "Bunny Trespassing".. 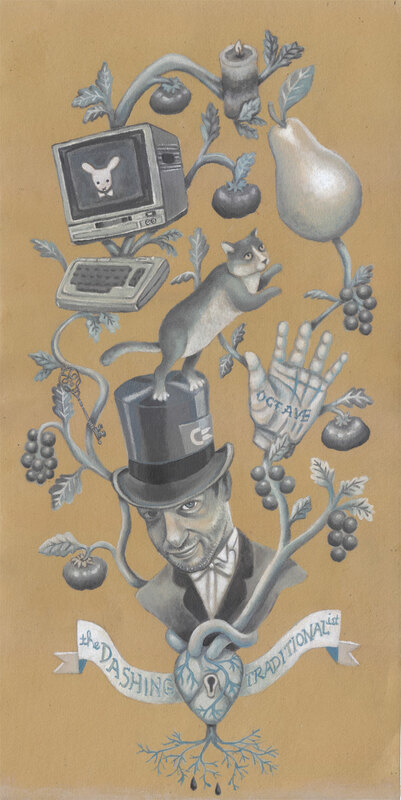 I'll show you more work in progress for this art show in my next blog posts. Let me know what you think. Am I on the right track or what? I enjoyed painting the cover for the December 2017 issue of Metaphorosis Magazine, a sci-fi/fantasy fiction magazine, so I hoped to work on another cover. I didn't know I'd get the opportunity again so quickly, like the following month's issue, January 2018. I'd like to think they loved how well the last cover turned out and that's why they came knocking on my door again. It makes it sound more flattering that way. The 1st thumbnail sketch for the January 2018 cover of Metaphorosis. But the truth is that the other cover artist that they had set up for January had to bow out so they asked me to fill in. I stepped up to the plate, ready to swing my bat again and win another one for the team.........wait a minute.........I'm an artist.......what's with the sports analogies?......errrr.......I mean I sat down to my art desk and took out my sketchbook and paints, ready to paint my heart out again. The final drawing for the painting. The story I was to illustrate for the cover was a cramped, tense, psychological, sci-fi story called, "Jewel/Gem Offer". 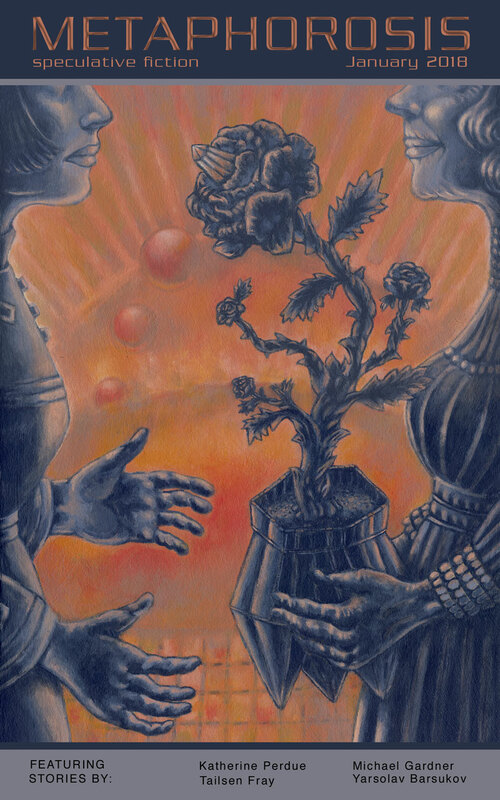 It's about an estranged mother who travels across the universe to bring her grown daughter a plant-weapon. I wanted to instill all those disturbing feelings in the story into my painting, so it needed to feel unsettling and claustrophobic. The work in progress of the painting. As usual, I worried and fretted as I painted, hoping it was good and that my editor would approve it. Was I getting the characters right? Did my illustration reflect the story's intent? Would it create curiosity and excitement for the January issue? The final cover that was too orange for my editor. When I turned in the final painting to my editor, he said he liked it, but it needed more of a color range for the background. He wasn't too fond of the orange. 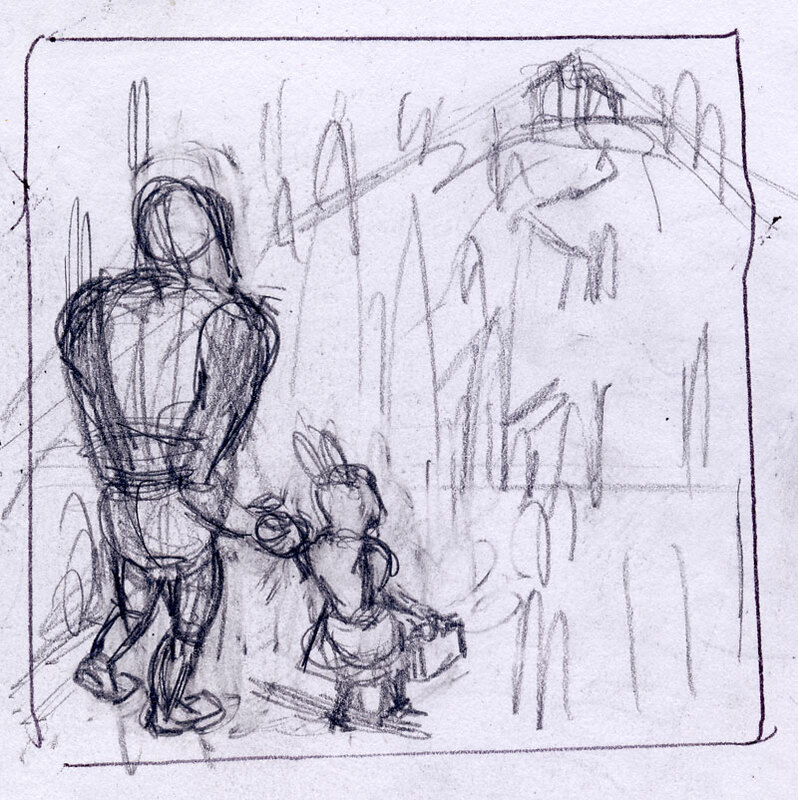 I went back to the original thumbnail sketch that I submitted to him. It did have more color; reds, oranges and yellows. The final cover with a more colorful background. Once I added them, he approved it and we were good to go. Above, you can see how it looks with the magazine title and text. Which cover did you like better? I asked a couple friend if they liked the orange one or the colorful one better? They couldn't agree. Personally, I liked it simpler and just orange, but that's just me. If you'd like to purchase this painting, click here.